For a solid 20, even 30 minutes, I was quite convinced that Captain America: The Winter Soldier wasn't just the best movie in the now nine-film mega-franchise called, for want of something more attractive, the Marvel Cinematic Universe; I was quite convinced it was the best comics-related work of cinema since The Dark Knight in 2008, irrespective of genre. That this turned out not to be the case has a lot to do with the problem faced by pretty much every Marvel film to date: having built up the story, the characters, and the tone for two-thirds of the thing, there comes a point where the filmmakers conclude that the best way to solve things is by throwing a whole bunch of CGI fight sequences at it and turning the sound mix up to eleven (The Winter Soldier has three major action setpieces; the one that climaxes the movie is the longest and by a considerable margin the worst). Still there's a lot of good in it, and at it's best, it's still a real highlight of a massively over-stuffed series that I, for one, have been increasingly bored with. No doubt that it's belongs in the very top tier of these things, boasting what amounts to a fairly humane and recognisable level of dramatic stakes (an increasingly controlling surveillance state vs. the magical evil wormhole in the gaseous Thor: The Dark World), and character moments that feel blissfully normal. 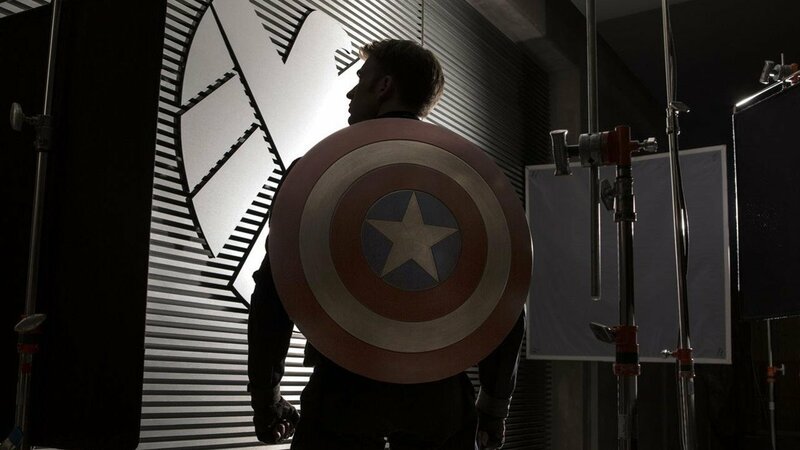 So much credit for that goes to the surprisingly low-key and engaging everyman persona taken on by Chris Evans, whose blossoming as Steve Rogers, titular captain and 1940s super-soldier out of time, has been quite a lovely thing to watch between Captain America: The First Avenger, The Avengers, and this. So obviously he'd be the most vocal in discussing how hemmed in he feels by the movies and how much he wants to give up acting when it's all don. Thus does the Hollywood machine treat its best and brightest. Anyway, the film opens strong - intensely strong, really, with the best scene in any Marvel film since the "Star-Spangled Man" montage in The First Avenger, which obviously doesn't count. It's a military sting operation set on a boat, with agents Rogers and Natasha Romanoff (Scarlett Johansson) of S.H.I.E.L.D. looking to rescue several of their own from a terrorist/pirate team led by one Georges Batroc (Georges St-Pierre, a UFC personality obviously cast for his physical skills rather than his charisma of an actor). It's maddeningly taut, and an immediate demonstration that directing brothers Anthony and Joe Russo learned quite a lot more about making a thriller from their work in television comedy than seems like should be remotely possible. The pacing is quick, expressed in a series of gratifyingly long shots that let the visuals do most of the work instead of the chop-socky editing that so much of modern action cinema has come to rely on in lieu of remotely interesting choreography or physical prowess - there's a wide shot from outside the plane, watching Rogers run through little vignettes broken up by the windows and open causeways of the ship, a whole series of mini-movies in one take, that is as creative and well-conceived an image as any mainstream American action film has boasted in ages. The writing is nearly as crisp as the directing, with tossed-off bantering dialogue given to Evans and Johansson that both of them ace, none of it so fussy as the arch Joss Whedon writing that sometimes announces itself too openly in The Avengers, and much of it doing a sterling job of setting the scene for anybody who somehow managed to stumble into this film without having seen any of its predecessors, without getting in the way of the many, many people who have. It also, admittedly, sets a bar that The Winter Soldier never hits or even comes close to, though plenty of the first hour is delightful and much of the second hour is at least satisfactory on the level of "big shiny go boom". Once the opening sequence wraps up (in the best tradition, it has a kind of vague MacGuffin-driven relationship to the rest of the plot, but could pretty easily be snipped out without doing a hint of damage to the overall structure. From here it turns into a convoluted mixture of secret societies and overreaching government-sponsored surveillance program, with good ol' Captain America, brought up in the very different moral universe of the '30s and the war years, horrified to discover what sort of shenanigans S.H.I.E.L.D., even in the apparently benign guise of Nick Fury (Samuel L. Jackson), is up to in the name of "protection". To listen to just about everyone involved in the production talk about it, this is a tribute to the grand old paranoia thrillers of the '70s, though this only really suggests that none of them watched any of those movies; even the presence of Robert Redford, the Condor himself, as one of several people with shadowy motives and behaviors, isn't really enough to put over the same feeling of overwhelming dread and confusion that those movies breathed like oxygen. Certainly, the film's muddled politics have nothing like the screaming urgency of any top-tier political thriller (the message boils down to "total authoritarian power is bad, unless good people are using it, then it's good", and the filmmakers seem uniformly unaware of this), though it's surprising and, frankly, hugely appealing to have any major Hollywood film with an eye on international markets being as open in its mistrust of the U.S. surveillance state, no matter how hard it works to shift the moral culpability for that state onto fantasy antagonists. Anyway, the plot is a bit holey and increasingly contrived, with enough plates spinning that even the titular Winter Soldier (Sebastian Stan, callow and not remotely up to the part, but that casting choice was already made for the movie) is relegated to something like a C-plot until the very end. But it's enjoyably energetic even so, giving its central protagonists, Rogers and Romanoff, plenty of time to play detective more than punch and kick, and to engage in the best kind of platonic flirting. Evans is in top form throughout - it's easily the best performance I've ever seen him give in any context - while Johansson starts to flatline in a monontone sarcasm that's too obviously straining to be badass for it to take, but they still have playful chemistry to spare, and it makes the middle of the film an exquisite mix of thriller and character dramedy. There's a stellar car chase along the way (to all appearances, one done with largely practical effects), with enough twists and cutaway scenes that despite being the longest Marvel movie outside of The Avengers, it moves faster than just about any of them; the Russos keep the actors jogging along while cinematographer Trent Opaloch shoots everything in a glossy palette based in greys that gives the film a sleek look that isn't quite the blandly uniform Marvel house style on everything they've done since forever. And then at a certain point the ending does have to happen, and well. There's a difference between a fleet, nervy thriller, and a big old heaving CGI action movie, and The Winter Soldier has a rough time navigating the difference between the two; there's a certain very specific scene (a fight in an elevator) where the editing goes to hell and never recovers, at least never in the action sequences, and the nimble action of the main body of the film is overwhelmed in an overlong finale that cross-cuts between multiple stages of action in a manner that at least leaves the geography of each of those places reasonably coherent, but renders the action within each of them so much generic tentpole action boilerplate, down to the exact beats of how Rogers climbs up the metal thing, then falls down, then the bad guy is there, then so on and so forth. For a movie content to explore generic territory totally new to superhero cinema, the ending surely does feel painfully overfamiliar, and it goes on forever. Or 15 minutes, maybe, but they are the film's lumpiest 15 minutes. A rocky, bland, noisy ending isn't enough to scuttle a movie, though it does leave The Winter Soldier feeling a bit samey and factory-produced, a fate that most of it is too good to deserve. And as slick, soulless action goes, it's better than average, not that it's a terribly good average. Still, the whole thing feels, in the aggregate, like an unwanted victory for the forces of corporatism: there is, or there seems to be, a great film that could have been made by the same people and much of the same raw material as The Winter Soldier, but commercial forces obliged it to instead be just pretty good. Which is still pretty good, but it's a little frustrating to have such a vivid proof of the film culture we have to live with nowadays.